It’s week 2 of the One Room Challenge and I’m sharing my inspiration. This week has been all about planning and figuring out all the details. Next week I hope to really start making progress. To give you a recap, my first space will be a new Shared Girls Bedroom for my 2 daughters. My theme is pretty traditional to my style with a “Modern Rustic Glam” look. It’s pretty much modern farmhouse meets glam. 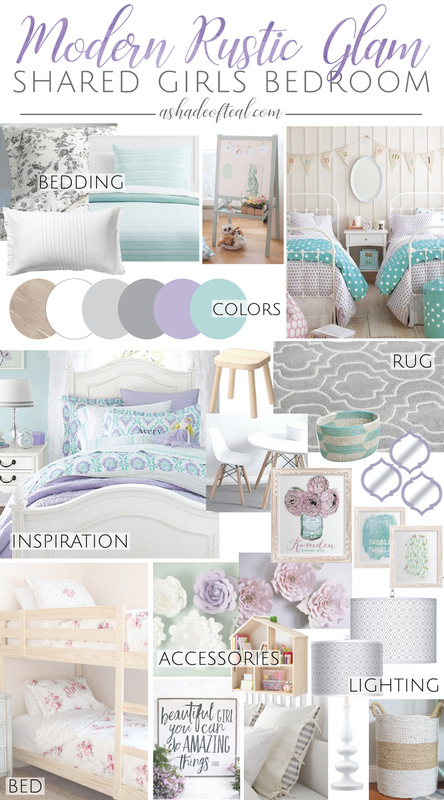 I’m trying to keep with a similar color palette as past spaces since I hope to re-use decor and accessories, so the color palette will be lilac/lavender mixed with aqua/mint and grey and white tones. That’s it for this week! Hope to have a bunch more progress next week. « Spook Your Space; a Spooktactular Entrance! Wow, I’m super impressed at your ambition of tackling two rooms at once! Looks like you’ve had success with some gorgeous room makeovers in past ORC… Excited to see how these two turn out!